Steve Baxter lived in a tent and cave after he fled the scene of a fight with Simon Clark, 54, in September, Swansea Crown Court heard. Mr Clark's body was found at his residential caravan in Grove Caravan Park in Pendine, Carmarthenshire. Mr Baxter, 52, and Jeffrey Ward, 40, both deny murder. The court heard Mr Baxter was found more than a month after Mr Clark's body was found. Giving evidence, he said he "feared for his life" during the fight at the Grove caravan park. He said Mr Clark "lunged" at him with two bars he was using as weapons. Mr Baxter added: "He went to stab me in the face with this bar thing." He said he was holding a knife in his right hand when he put his hands up to defend himself and tried to "parry" his blows. Mr Baxter said he knew he had made contact with Mr Clark after he "grunted". 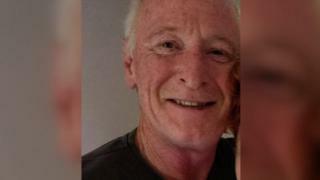 He told jurors Mr Clark walked back to his caravan after saying he was going to ring the police, but did not find out he had died until the following day. Mr Baxter told his partner Linda Rowley and Mr Ward "he stabbed me and I stabbed him back". Asked by Leonard Smith, defending, why he had not turned himself into police, he said he did not believe he would be treated fairly because he'd been in "quite a bit" of trouble when he was younger. Mr Baxter avoided a manhunt for more than a month and lived off seaweed, mussels and other foraged foods, the court heard.